Towards the end of last year, I got a new laptop: the Purism Librem 13. It replaced the Lenovo ThinkPad X250 that I was using previously, which maxed out at 8 GB RAM and was beginning to be unusable for Firefox builds. This is my first professional laptop that isn’t a ThinkPad; as I’ve now been using it for over half a year, I thought I’d write some brief notes on what my experience with it has been like. My main requirement from a work point of view was having at least 16 GB RAM while staying in the same weight category as the X250. There were options meeting those criteria in the ThinkPad line (like the X270 or newer generations of X1 Carbon), so why did I choose Purism? Purism is a social benefit corporation that aims to make laptops that respect your privacy and freedom — at the hardware and firmware levels in addition to software — while remaining competitive with other productivity laptops in terms of price and specifications. Tamper evidence via Heads, though this is a newer feature and was not available at the time I purchased my Librem 13. These are features I’ve long wanted in my computing devices, and it was exciting to see someone producing competitively priced laptops with all the relevant configuration, sourcing of parts, compatibility testing etc. done for you. The Librem’s aluminum chassis looks nicer and feels sturdier than the X250’s plastic one. At 13.3″, the Librem’s screen size is a small but noticeable and welcome improvement over the X250’s 12.5″. The X250 traded off screen size for battery life. It’s the same weight as the 14″ ThinkPad X1 Carbon; the weight savings from a smaller screen size go into extra thickness, which allows for a second battery. I was pleased to see that the Librem, which is the same thickness as the X1 Carbon and only has one battery, has comparable battery life to the X250 (5-6 hours on an average workload). The Librem’s screen is not a touchscreen. I noticed this because I used the X250’s touchscreen to test touch event support in Firefox, but I don’t think the average user has much use of a touchscreen in a conventional laptop (it’s more useful in 2-in-1 laptops, which Purism also offers, and that does have a touchscreen), so I don’t hold this against Purism. The maximum swivel angle between the Librem’s keyboard and its screen is 130 degrees, compared to the X250’s almost 180 degrees. I did occasionally use the X250’s greater swivel angle (e.g. when lying on a couch), but I didn’t find its absence in the Librem to be a significant issue. Also missing in the Librem are the buttons above the touchpad for left-, right-, and middle-clicking; you instead have to click by tapping the touchpad with one, two, or three fingers (respectively), which I find more awkward and prone to accidental taps. Finally, while I haven’t noticed this very much myself (but I tend not to be very discerning in this area), several people who have briefly used my Librem commented that the sensitivity of its touchpad is significantly reduced compared to other touchpads they’re used to. The Librem’s keys feel better to the press than the X250’s. However, I’ve found you have to hit the keys fairly close to their centre for the press to register; the X250’s keys were more sensitive in this respect (hitting the side of the key would still trigger it), so this took some getting used to. The keyboard can be backlit (at two different levels of intensity, though I don’t think I’ve ever used the second one). However, the shortcut to activate the backlight (Fn + F10) is significantly harder to find in the dark than the X250’s (Fn + Space). I’ve also found the Librem’s keys get sweaty more easily, I’m guessing due to different materials. The Librem’s keyboard layout differs from the X250’s in several small but important ways. Some of the changes are welcome; others, less so. On the other hand, the biggest deficiency in the Librem’s keyboard is the lack of PageUp, PageDown, Home, and End keys. 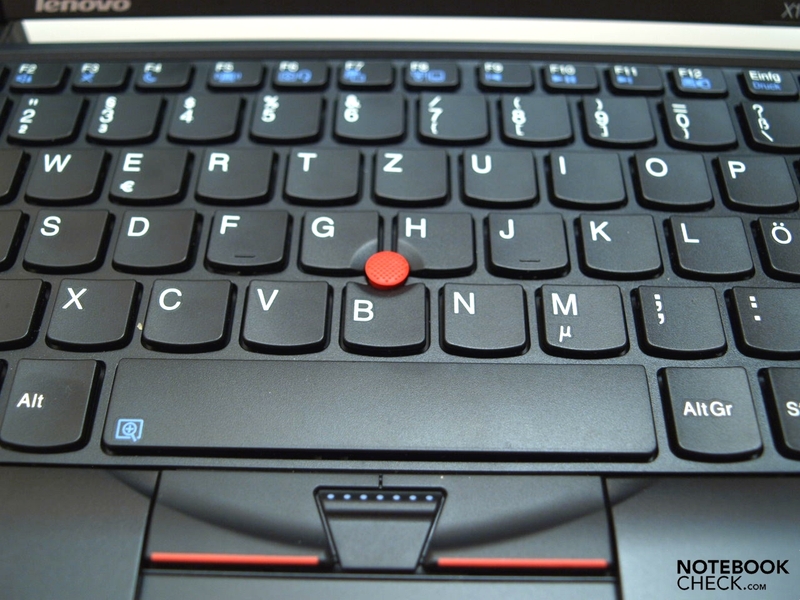 The X250 had all of these: PageUp and PageDown above the right and left arrow keys, Home and End in the top row. With the Librem, you have to use the arrow keys with the Fn modifier to invoke these operations. My typing style is such that I use these operations fairly heavily, and as such I’ve missed the separate keys a lot. A related minor annoyance is the fact that the rightmost key in the second row from the bottom is not Shift as it usually is, but a second Fn key; that’s also an impedient to muscle memory across different keyboards. Lastly, the key in the top right corner is the power key, not Delete which is what I was used to from the X250. None of these are necessarily dealbreakers, but they did take some getting used to. Every time I’ve tried the Librem’s microphone so far, the recording quality has been terrible, with large amounts of static obscuring the signal. I haven’t yet had a chance to investigate whether this is a hardware or software issue. The Librem 13 comes with Purism’s own Linux distribution, PureOS. PureOS is basically a light repack of Debian and GNOME 3, with some common software pre-installed and, in some cases, re-branded. I got the impression that PureOS and its software doesn’t get much in the way of maintenance. For example, for the re-branded browser that came with PureOS, “PureBrowser”, the latest version available in the PureOS repository at the time I got my Librem was based on Firefox 45 ESR, which had been out of support for some 6 months by that time! I’m also not a huge fan of GNOME 3. I tolerated this setup for all of about two weeks, and then decided to wipe the PureOS installation and replace it with a plain Debian stable installation, with KDE, my preferred desktop environment. This went without a hitch, indicating that — as far as I can tell — there isn’t anything in the PureOS patches that’s necessary for running on this hardware. Generally, running Linux on the Librem 13 has been a smooth experience; I haven’t seen much in the way of glitches or compatibility issues. Occasionally, I get something like a crashed power management daemon (shortcuts to increase/decrease brightness stop working), but nothing too serious. The Purism Librem 13 has largely lived up to my goal of having a lightweight productivity laptop with a decent amount of memory (though I’m sad to say that the Firefox build has continued to get larger and slower over time, and linking is sometimes a struggle even with 16 GB of RAM…) while also going the extra mile to protect my privacy and freedoms. The Librem 13 has a few deficiencies in comparison to the ThinkPad line, but they’re mostly in the category of papercuts. At the end of the day it boils down to whether living with a few small annoyances to benefit from the additional privacy features is the right tradeoff for you. For me, so far, it has been, although I certainly hope the Purism folks take feedback like this into account and improve future iterations of the Librem line.